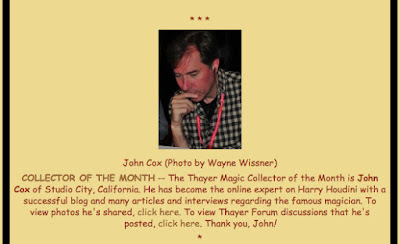 Yesterday I was tickled to see that I had been named "Collector of The Month" at the great Thayer Magic website and forums. Thayer is a private magic collector community run by the tireless Phil Schwartz. Considering how many heavyweight collectors contribute to Thayer everyday, this is an honor. Thank you Phil! The photo of above is of me listening to Arthur Moses's full, unreleased Houdini voice recordings at the 2012 Magic Collectors Weekend in Chicago. Congratulations John! I'm pretty certain WAH is at the vanguard of all current things HH.